US files charges against Chinese telecom giant Huawei for stealing trade secrets among others. Ever since former Starbucks chief executive Howard Schultz said in an interview Sunday that he was “seriously considering” running for President ahead of the 2020 elections, US leaders, including President Donald Trump, and media moguls have come out strongly against the proposed idea. 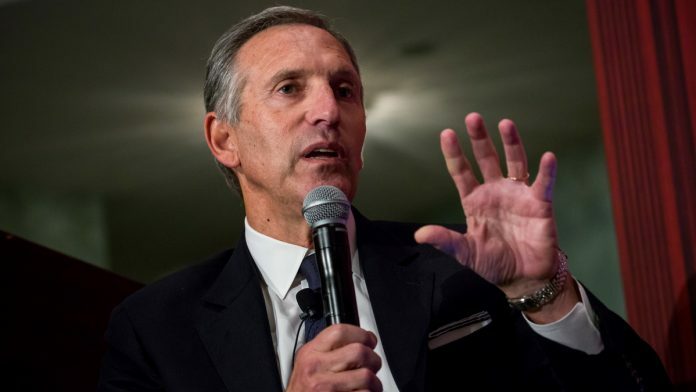 In CBS News’s popular 60 Minutes, Schultz, a visionary credited to have taken Starbucks to great heights, told correspondent Scott Pelley that he is “seriously thinking of running of running for President” as a centrist independent candidate had been a self-proclaimed Democrat all his life. Before long, Americans across the spectrum began speaking out against his proposed candidacy. The US President has journalists, historians and ordinary citizens on his side against Schultz’s possible presidency campaign, if he confirms it. Business tycoon and former three-time mayor of New York City Mike Bloomberg said Monday that there was no chance for an independent candidate of winning the election — a reason that forced Bloomberg out of the race in the 2016 contest. Though he didn’t refer to Schultz directly, the message was meant to for the ex-Starbucks chief, said the media. History professors Kevin Kruse and Julian Zelizer argued in an article for CNN that a possible Schultz campaign would be reminiscent of the presidential campaign of consumer advocate and political activist Ralph Nader in 2000 that ultimately saw the race boil down to the one between Democrat Al Gore and Republican George W. Bush. The Republican won the election. Michelle Goldberg, an opinion columnist, argued the same in The New York Times, referring to Bloomberg’s case. Democrats won’t be too welcoming of a possible Schultz campaign after Bill Burton, former advisor to Barack Obama, joined Schultz’s team. Here’s a look at how other American personalities have reacted to the possibility of Schultz campaign. The only rational response to @HowardSchultz is to boycott and hopefully destroy the company he built @Starbucks. The cash you’ve been laying out for years for bitter coffee is going to help fund four more years of Trump. There’s @GradysColdBrew. So no real loss. The consultants who sign on with the Howard Schultz campaign may help facilitate the second Trump term. Please don't run. Your candidacy would divide voters who reject Trump. We can't afford that right now. The US Justice Department Monday filed a string of charges against Chinese telecom giant Huawei and its chief financial officer Meng Wanzhou for indulging in stealing trade secrets, obstructing a criminal probe, and evading US-imposed sanctions on Iran. Wanzhou was arrested in Vancouver on 1 December over US allegations that she had made use of one of her company’s subsidiaries, Skycom, to evade Iran sanctions between 2009 and 2014. Canada made the arrest at the behest of US, an event that increased friction between Ottawa and Beijing, amid ongoing economic and political tensions between US and China. In Monday’s judicial pronouncement, US prosecutors reiterated the allegations that Huawei used the Hong Kong-based shell company Skycom to sell its equipment in Iran. “In reality, Huawei orchestrated the sale to look like a transaction between two unrelated parties, but Huawei actually controlled the company that purchased Skycom, according to the indictment,” the report added. He said Huawei has been doing this for the past ten years. In recent months, US has escalated efforts to urge countries to not consider Huawei for building their 5G telecom networks. Charges levelled against Huawei in the US are being seen by media agencies as a potential factor to further fuel tensions between the US and China even as Trump’s officials have maintained that this will not impact their trade talks. China’s Vice-Premier Liu He is currently in Washington to negotiate with key US officials, including US Trade Representative Robert Lighthizer, over how this trade war can be put to an end.